Thyme is the common name for any of the about 350 species of aromatic, perennial herbs and low shrubs comprising the flowering plant genus Thymus of the mint family (Lamiaceae or Labiatae), and especially the common or garden thyme, Thymus vulgaris, whose leaves are popularly used as a seasoning and whose essential oil is used medicinally. Another well-known thyme species is T. serpyllum, known variously as wild thyme, creeping thyme, or mother of thyme, which also is used as a culinary and medicinal herb and is an important nectar source for honeybees. The term thyme also is used more specifically to refer to the dried leaves of those varieties of thyme used for seasoning. In general, thyme is one of the world's more well-known and useful plants, with both the fresh and dried leaves valued for flavoring food, and the essential oil adding many medicinal values. Even the flowering tops are used in food preparation. As a culinary spice, the various species and cultivars of thyme provide a diversity of aromas and tastes that have added to the human enjoyment of many foods in cuisines all over the world, contributing in ways that go beyond simple utilitarian values. Thyme is planted for aesthetic purposes, while it also grows wild and serves as a nectar source to honeybees that yield thyme honey as a food item. Lamiaceae (or Labiatae), the flowering plant family to which thyme belongs, has about 210 genera and some 3,500 species. Lamiaceae plants are frequently aromatic in all parts and include many widely used culinary herbs in addition to thyme, such as mint, rosemary, sage, savory, marjoram, oregano, basil, lavender, and perilla. Many members of the family are widely cultivated, owing not only to their aromatic qualities but also their ease of cultivation: These plants are among the easiest plants to propagate by stem cuttings. Besides those grown for their edible leaves, some are grown for decorative foliage, such as coleus and snow-on-the-mountain. Others are grown for food purposes, but seeds are utilized instead of leaves, such as with chia. The leaves emerge oppositely, each pair at right angles to the previous one (called decussate) or whorled. The flowers are bilaterally symmetrical with five united petals and five united sepals. 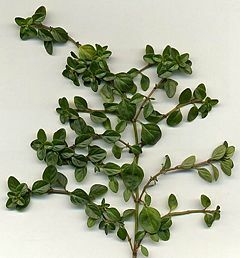 Thymus is a genus of about 350 species of aromatic perennial herbaceous plants and sub-shrubs to 40 centimeters (cm) tall, native to Europe, North Africa, and Asia. A number of species have different chemotypes. The stems tend to be narrow or even wiry; the leaves are evergreen in most species, arranged in opposite pairs, oval, entire, and small, four to 20 millimeters (mm) long. Leaves tend to be rolled inward and slightly hairy (Hanrahan and Odle 2005). The tiny flowers are in dense terminal heads, with an uneven calyx, with the upper lip three-lobed, and the lower cleft; the corolla is tubular, four to ten mm long, and white, pink, blue, or purple, depending on the species. Seeds are tiny and abundant (Hanrahan and Odle 2005). Garden thyme, Thymus vulgaris, is the most used type of thymus and is an Old World low shrub with gray-green leaves and a pungent, minty, light-lemon aroma (Herbst 2001). It grows up to 38 cm (15 inches) high and has a woody, fibrous root (Hanrahan and Odle 2005). Wild thyme, T. serpyllum, is another Old World species. European colonists probably introduced it to North America, where it is now naturalized (Hanrahan and Odle 2005). It has low-lying, creeping stems, and is also known as "creeping thyme." The name serpyllum refers to the serpent-like growth of the members of this species (Hanrahan and Odle 2005). Thyme is widely cultivated and grown for its strong flavor, which is due to its content of thymol (Huxley 1992). Garden thyme likes a hot sunny location with well-drained soil. It is planted in the spring and thereafter grows as a perennial. It can be propagated by seed, cuttings, or by dividing rooted sections of the plant. It tolerates drought well (GG 2007). Thymus species are used as food plants by the larvae of some Lepidoptera (butterfly and moth) insect species including Chionodes distinctella and the Coleophora case-bearers C. lixella, C. niveicostella, C. serpylletorum, and C. struella (the latter three feed exclusively on Thymus). The thymus species are an important nectar source for honeybees. Thyme has been used since ancient times for its culinary, medicinal, and even presumed magical qualities (Hanrahan and Odle 2005). Ancient Egyptians used thyme in embalming. The ancient Greeks used it in their baths and burnt it as incense in their temples, believing that thyme was a source of courage. (Courage is "thumus" in the Greek language, and may be the inspiration for the generic name) (Hanrahan and Odle 2005). Greek men would rub the herb on their chests (Hanrahan and Odle 2005). Tradition also held that an infusion of thyme taken on a midsummer's eve as a tea would enable one to see fairies dancing (Hanrahan and Odle 2005). It was thought that the spread of thyme throughout Europe was thanks to the Romans, as they used it to purify their rooms and to "give an aromatic flavor to cheese and liqueurs" (Grieve 1931). There also was a belief among the Romans that thyme added to bath water would impart energy (Hanrahan and Odle 2005). The Roman naturalist and philosopher Pliny the Elder recommended the burning of the dry herb in the home to "put to flight all venomous creatures" (Hanrahan and Odle 2005). In the European Middle Ages, the herb was placed beneath pillows to aid sleep and ward off nightmares (Huxley 1992). In this period, women would also often give knights and warriors gifts that included thyme leaves as it was believed to bring courage to the bearer. Thyme was also used as incense and placed on coffins during funerals as it was supposed to assure passage into the next life (ECGN 2008). Thyme has been used for centuries for seasoning of foods, and also long recognized for its antiseptic properties (Hanrahan and Odle 2005). It was used in sickrooms to help stop the spread of disease and the essential oil was used on surgical dressings and to treat battle wounds even as recently as World War I (Hanrahan and Odle 2005). Thymus vulgaris (common thyme or garden thyme) is a commonly used culinary herb. It also has medicinal uses. Common thyme is a Mediterranean perennial that is best suited to well-drained soils and enjoys full sun. Thymus herba-barona (caraway thyme) is used both as a culinary herb and a ground cover, and has a strong caraway scent due to the chemical carvone. Thymus × citriodorus (citrus thyme; a hybrid of T. pulegioides × T. vulgaris) is also a popular culinary herb, with cultivars selected with flavors of various citrus fruit (lemon thyme, etc.). 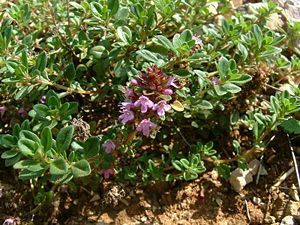 Thymus serpyllum (wild thyme, creeping thyme, mother of thyme, and mountain thyme) is an important nectar source plant for honeybees, and Greece and Sicily are especially famous for wild thyme honey. All thyme species are nectar sources, but wild thyme covers large areas of droughty, rocky soils in southern Europe and North Africa, as well as in similar landscapes in the Berkshire Mountains and Catskill Mountains of the northeastern U.S. Lemon thyme—a subvariety of wild thyme. It actually smells lemony, with a more pronounced lemon aroma than the garden thyme (Herbst 2001). Variegated lemon thyme—a thyme with bi-color leaves. Orange thyme—an unusually low-growing, ground cover thyme that smells like orange. Creeping thyme—the lowest-growing of the widely used thymes, used for walkways. Silver thyme—a white/cream variegated cultivar. English thyme—a subvariety of garden thyme. It is broad-leafed. The most common cultivar. Species. The following is a general listing of some of the species of Thymus. The various thyme species are used for culinary, medicinal, and ornamental use. Thyme is best known as a culinary herb and is used for a wide variety of meat, poultry, and fish dishes, soups, sauces, and vegetables. The essential oil, which has antiseptic and anesthetic properties, is used for a number of medicinal purposes, and also is added to perfume and toothpaste. Some thymes are used for ground cover. Thyme is used most widely in cooking. Thyme is a basic ingredient in Spanish, French, Italian, Turkish, and Persian cuisines, and in those derived from them. It is also widely used in Lebanese and Caribbean cuisines. Thyme is often used to flavor meats, soups, and stews. It has a particular affinity to and is often used as a primary flavor with lamb, tomatoes, and eggs. Thyme, while flavorful, does not overpower and blends well with other herbs and spices. In French cuisine, along with bay and parsley, it is a common component of the bouquet garni and of herbes de Provence. In some Middle Eastern countries, the condiment za'atar contains thyme as a vital ingredient. Thyme is sold both fresh and dried. The fresh form is more flavorful but also less convenient; storage life is rarely more than a week. While summer-seasonal, fresh thyme is often available year-round. Fresh thyme is commonly sold in bunches of sprigs. A sprig is a single stem snipped from the plant; it is composed of a woody stem with paired leaf or flower clusters ("leaves") spaced one-half to one inch apart. A recipe may measure thyme by the bunch (or fraction thereof), or by the sprig, or by the tablespoon or teaspoon. If a recipe does not specify fresh or dried thyme, it is usually assumed that it means fresh. Depending on how it is used in a dish, the whole sprig may be used (for example, in a bouquet garni), or the leaves removed and the stems discarded. Usually when a recipe specifies "bunch" or "sprig" it means the whole form; when it specifies spoons it means the leaves. It is perfectly acceptable to substitute dried for whole thyme. Thyme retains its flavor on drying better than many other herbs. Dried, and especially powdered thyme, occupies less space than fresh, so less of it is required when substituted in a recipe. Dried thyme, including both leaf and powder form, is available year round, but, as with other herbs, should be stored in a dark, cool place for no more than six months (Herbst 2001). As with bay, thyme is slow to release its flavors so it is usually added early in the cooking process. Both the fresh and dried leaf and the essential oil are used medicinally, and thyme is one of the most versatile herbs for home remedies (Hanrahan an Odle 2005). It has antiseptic, analgesic, diuretic, antispasmodic, and diaphoretic (increases perspiration) properties (Hanrahan and Odle 2005). The essential oil of common thyme (Thymus vulgaris) is made up of 20-55 percent thymol (HerbMed). Thymol, a crystalline phenol, is a "powerful and proven antibiotic and antiseptic that enhances the immune system and fights infection" (Hanrahan and Odle 2005); it is the main active ingredient in Listerine mouthwash (Pierce 1999). Before the advent of modern antibiotics, thyme oil was used to medicate bandages (Grieve 1931). It has also been shown to be effective against the fungi that commonly infects toenails (Ramsewak et al. 2003) and causes athletes' foot (Hanrahan and Odle 2005). Externally applied, the essential oil is considered good for health maintenance of the teeth and gums and for relieving toothache (Hanrahan and Odle 2005). The essential oil is used as a massage oil to relieve rheumatism, gout, and sciatica, and as chest rub to break up inflammation of the mucous membrane (catarrh) of the upper respiratory tract (Hanrahan and Odle 2005). A tea made by infusing the herb in water can be used for cough and bronchitis (HerbMed). Medicinally, thyme is used for respiratory infections in the form of a tincture, tisane, salve, syrup, or by steam inhalation. Because it is antiseptic, thyme boiled in water and cooled is considered effective against inflammation of the throat when gargled. Thyme tea, taken warm, also is used for relief of menstrual pain and to relieve diarrhea, and a warm infusion can relieve migraine headaches and colic, and expel worms (Hanrahan and Odle 2005). The essential oil of thyme is not to be taken internally. Excessive use of undiluted essential oil is toxic, causing such complications as diarrhea, nausea, vomiting, headache, and dizziness, and even slowing the heartbeat, depressing respiration, and lowering body temperature (Hanrahan and Odle 2005). Externally, in undiluted form it may cause skin irritation, and should be diluted before use (Hanrahan and Odle 2005). Thyme used in very small amounts in culinary preparations is generally safe, but in large amounts can be a uterine stimulate, and pregnant women generally should not use the herb, tincture, or essential oil (Hanrahan and Odle 2005). The Food and Drug Administration (FDA) of the United States rates thyme as "food safe" (Hanrahan and Odle 2005). eFloras.org. n.d. Flora of China: Thymus Flora of China 17: 233. Retrieved April 8, 2007. English Cottage Garden Nursery (ECGN). 2008. Thyme (Thymus) English Cottage Garden Nursery. Retrieved April 7, 2008. Golden Garden (GG). 2007. Herb File: Garden Thyme (Thymus vulgaris) Global Garden. Retrieved April 7, 2008. Grieve, M. 1931. A Modern Herbal: Thyme, Garden Botanical.com. Retrieved February 9, 2008. Hanrahan, C., and T. G. Odle. 2005. Thyme. In J. L. Longe (ed. ), The Gale Encyclopedia of Alternative Medicine. Farmington Hills, Mich: Thomson/Gale. ISBN 0787693960. HerbMed. n.d. Thymus Vulgaris Herbal Medicine. Montvale, NJ: Medical Economics Company. Retrieved April 7, 2008. Pierce, A. 1999. The American Pharmaceutical Association Practical Guide to Natural Medicines. New York: Morrow. ISBN 0688161510. Ramsewak, R.S., et al. 2003. In vitro antagonistic activity of monoterpenes and their mixtures against "toe nail fungus" pathogens. Phytother Res. 17(4): 376-9. Rohde, E.S. 1969. A Garden of Herbs. New York: Dover Publications. ISBN 0486223086. This page was last modified on 7 December 2015, at 23:08.